2017 in retrospect and changes planned for 2018. This is being done slightly earlier than bloggers traditionally do, simply to give some new content to anyone on Christmas Day, who wants some hobby browsing time, but is finding the internet pretty quiet over the holiday period. So it is a lengthy post, but for good reason ...... coffee time! Since my blog is more article based than diary or snippet driven, doing a yearly reflection allows me a more conversational style of post. Yes, it is something of a self indulgence, but why not! The following relates to a year of recalibrating my boardgame collection and giving figure gaming a tighter focus, while making a determined go at the re-organisation of hobby time, storage space and looking over the horizon to future plans. For this gamer, 2017 has proven to be an interesting year and has delivered something of a gaming crossroads, though it started in the same old way as 2016 did …… that is, with my attention being significantly distracted on the issue of figure scale, or more to the point, the pressure of storage space that suddenly brings the issue of scale, collecting in multiple periods, stacks of terrain, unused boardgames etc into sharper focus. In fact, when I look back to the 2015 Christmas post, there are just too many similarities of the same ilk, so it is definitely a time to move things on. Previously, for me at least, figure wargaming had been fairly simple. As an extension to my boardgaming, I kept to the smaller scales, used hexes because I liked them and they helped my back-ache (no measuring into the centre of tables) and the collections for my small table were modest. Then two things happened, I bought some 28mm plastics, painted them and loved them and I moved house, with the new accommodation giving me a slightly larger separate gaming space (roughly 4’ wide x 3’ 1/2 deep extendable to 6’ wide) where games could be left set up over a couple of days. Some will see this as still a small space, others as luxury, but we are all at different places with such things. This was enough to encourage me to want to do something with the 28’s. Most certainly with smaller unit frontages (6” for Horse and Musket) and buildings with smaller footprints, probably using 20mm resins. And so, for a good two years, I have been collecting both large and small scales, with the large scale being simply lovely and the small scale more practical to my gaming and storage environment. This ‘over collecting’, especially on terrain has put significant stress on my storage capacity and things have been stacking up on the floor as shelves bulged to full. The indecision on what to do continued from 2016 into the current year, which in turn brought disruption to the simple pleasures of just getting on with gaming and procrastination prospered as the direction of where to invest efforts became a confusing mess. To make matters worse, I also started to get drawn fairly significantly into 15mm, no doubt thinking they would bridge my scales dilemma. Simply put, the amount of non-painting that has happened as a result is significant. I would get a slice of time to get the brushes out, but then couldn’t decide which scale to paint and so rather than paint the ‘wrong one’, I would instead default to doing something else - which all too often has been internet browsing. Ross McFarlane (blogger of ‘Battle Game of the Month’) commented on this subject on one of my blog posts and rather cleverly put it that trying to work out these sort of things are not just of the physical (i.e. storage problems and preferred scale), but also of the mental (i.e a distraction, inertia etc). There is a link to his blog in the resource section below. So as 2017 began, collections in different scales were still growing and still occupying the painting table in equal measure. The renovation at home, which was to last a full two years and only ended last month, continued at a slow pace and probably lay at the root of the deterioration in my back ache that simply refused to improve. The first show of the year that I went to was York (Vapnartak - UK) in February - a magnificent show, but one that I could not enjoy, due to limitations of not being able to stay on my feet for any useful period. 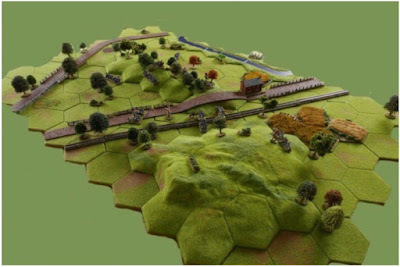 A pre-order was collected from Kallistra to start a 12mm 1066 project, together with slope hex tiles to allow my hex terrain to at least start reflecting the Senlac Ridge at Hastings. I also picked up a few lovely 10mm buildings from Timecast for WWII, which was a spontaneous buy as I passed their booth on the way to the Kallistra stand. I didn’t really get a chance to see anything else for needed inspiration or to make traders happy! due to my discomfort and the difficulty in negotiating a show packed with visitors and having to stand in queues at traders tables. Since this visit included an overnight stay and I didn’t get much out of the show, it turned out to be rather an expensive weekend for something that just could have been mail ordered. Now even just articulating that thought annoys me, because it plays into the increasingly common perception that some shows are just becoming commercial shopping spaces, which hardly makes them internet proof enough to get the punters in, if indeed that is what they are to become. Rather I would prefer to think of shows as simply a place to immerse myself in the rather joyous experience of just being amongst what I like best, I want it to be a satisfying self-indulgent moment in time - my treat! An eye fest, with purchases being generated from the raw enthusiasm created by the show experience itself. I know that sounds a bit fluffy, but there you are! Having missed some other shows during the rest of the year, I have a more determined ambition to get back to a more normal visiting of four or more shows in 2018, with some targeted spending to make sure that my closest show gets the biggest part of the purse to help it prosper and stay alive. 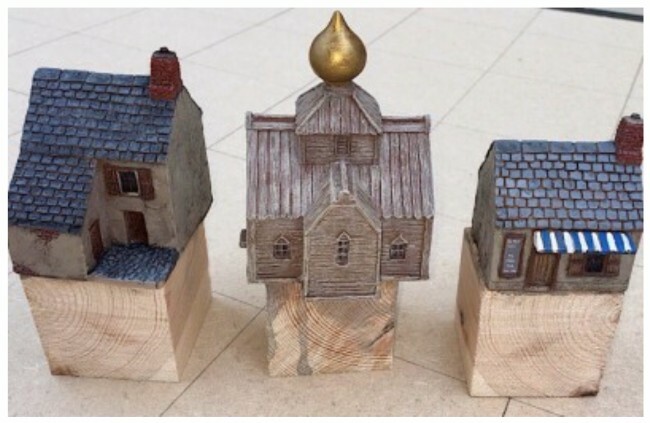 Around the same time, I made a few mail orders with Battlescale for their really nice growing range of resin 10mm buildings, which have good character. To the cafe on the right, I did a menu notice with white on black, so that it looked like a chalkboard and shrank it down for the printer. I think it looks rather good. A project page was started over on my Commanders website with monthly updates to try and bring some focus and discipline in getting particular projects done. However, for the next few months due to a local game store having a good figure range with a discount and another hobby shop giving a heavy discount (25%) for stock adjustment, my remaining purchases were of the 28mm plastic type. The problem of housing collections of two scales was reaching a critical point storage wise, something that was plain to see, especially as in my storage places, available floor space to negotiate was getting smaller, though happily, Mrs. Smith has always remained kindly silent on the subject. On top of the 12mm 1066 figures that had started amassing, I had bought 8 boxes of plastic 28mm for the 1066 period, which was a stupid contradiction of project focus to have created, as it just fuelled this multi-tracked mind and fed into a real clash of scales and division of effort, throwing this years main 1066 project into chaos. Hmmm - some indecision at play here, Ross, you are so right, it is as much about mindset as it is of the physical! By May, I had completed the beta version of my Two Flags - One Nation rules (hexed based ACW rules that I was using with 12mm Kallistra figures), making them freely available online. I had really enjoyed resurrecting these rules, which had travelled from a hex based version around 2002, into a kriegspiel game and then to an open board figure game and finally this year, returning to it’s hex based roots. Originally I had used 5” hexes with 1/72 plastic Italeri figures and metals from Irregular Miniatures and had a scenario based upon the opening moves against McPherson Ridge on the 1st day of Gettysburg. Myself and Mike enjoyed a couple of plays of the scenario, which seemed well balanced and worked from the get-go and as a scenario, continues to do so right through to this years version. It has proven to be a great benchmark to test the various changes and meanderings of these rules. Though even here, despite all of the work that has recently been going into the rules and the rounding out of my 12mm ACW armies with the addition of some cavalry and limbered guns, my interest in 28mm Perry Plastic ACW on an open table was stealing my attention both on the painting table and in trying to find a set of commercial rules for the 28’s (Pickett’s Charge being my latest acquisition). Everything rather came to a head in mid June. Storage was maxed out and my bad back continued to niggle, the result being that gaming with hexes was just so much easier than leaning over tables for precise measurement and positioning. With a wargame show due mid month that also happened to have a very good Bring ‘n Buy, the chance to substantially off-load gaming stuff brought a much needed opportunity to rebalance. With hindsight it is pretty obvious what needed culling, but even on the days leading up to the show, I had packaged and labelled elements of both scales, failing to decide which scale to rid of until literally the day before the show. I am probably starting to sound pathetic now to those of a more certain mind about such things. I suppose if nothing else, it does at least reflect that there is a multitude of choice out there of superbly crafted goodies in this rather unusual and small hobby of ours, something we now largely take for granted, though perhaps less so by the ‘Airfix Generation’ who can recall quite different times. Anyway, a goodly proportion of the 28mm stuff was sold and it was surprising that after so much indecision and faffing around, that in just that single week, there was a real sense that a direction and focus had returned to the figure side of my gaming. I don’t think in general that collecting 28mm of itself causes as much of a serious storage problem that is often supposed, since I would still be deploying to the same sized table, so for the smaller scales that would mean more unit bases, more buildings and terrain features, so the footprint bulk is not too dissimilar, except that the stuff in 15mm, 20mm and 28mm generally needs deeper boxes. For me, the villain of the piece is collecting in multiple scales and periods, which exaggerates the amount of terrain needed, so going to a single terrain scale is the biggest space saver. 28's they are just lovely - ain't it so! Obviously the selling at the game show generated some decent funds to recycle and bring in some new stuff. I added to my Kallistra hex terrain, bought more of their troops for my 12mm 1066 project and bought a brigade of 15mm French napoleonic, just to see how that would look on the 4” hex terrain (Oh no, here we go again!). For gaming, I am able to sit at the dining table for smaller games and stand when I put up my temporary aluminium pasting tables. These have extendable legs, so can be set to just over 37” high, but I needed to make them a little higher, so that there would be even less need to lean forward over the table. A visit to the builders yard yielded a couple of lengths of the square plastic down spout piping that runs from roof guttering down to the ground. From these, I made two pair of ‘skids’ for the table legs to sit on. One pair was 4’ long and the other was 6’ long for when I add the third table, to take the table from 4’ to 6’ wide. Down each end of the pipes I squirted some of that dreadful expanding foam stuff, which once cured, I shaved the ends off flat. I assumed that this would add some strength / stability, while being uber light and also keep insects out when stored in the garage. With my boards and Kallistra tiles on the tables and the tables on the skids, the table top is now just over 40” high, which seems to suit me when standing. The height means you don’t have to bend forwards so much to get to the middle of the table and this really does translate into a few degrees difference in how far the back is repeatedly required to tilt forward over a few hours, significantly reducing that stress position for bad back suffers. One of the things that I want this game space to do is to allow me to indulge in some two mapper board games, that need to be generally left set up longer than the demands on the family dining table allow. In past years, this option has never been open to me, so I just avoided buying those types of games and I think, to my regret, that I have missed out on some more involved gaming as a result. Quite a few years ago (2000), I was left ‘Home Alone’ for the weekend and took the opportunity to put out the two mapper Barbarossa (in the Command Magazine) by Ty Bomba called Proud Monster. Published in 1999, the game came with an eye watering (to me at least) 900 counters, but with a system described as a playable monster. I gave the game 8 hours on the Saturday and the same again on the Sunday. It was a fantastic gaming experience to me, something of a wargame fest, but it seems almost both ridiculous and somewhat sad to me that considering all of this is my passion, I have not repeated that sort of thing since. That needs to change and this coming year it can. As part of my ‘re-organisation of wargaming life 2018’ plan (I promise this is just in my head, not written down anywhere like a pledge or anything! ), I have had to do a quite bit of selling, with a slew of 15mm stuff recently going via e-bay, but this has allowed for a bit of buying to get some of these board games that are ‘bigger in scope’, while maintaining the lower complexity systems that I like best. Games that I have bought in the past couple of months with that in mind have been Barbarossa Deluxe, the Russo-German War 1941 - 45 from Decision Games, The Eagles of France, Napoleonic series from Hexasim covering Waterloo, Austerlitz and Ligny so far and the Nouville (Bastogne) and Dark July 43 (Prokhorovka battles in the Kursk campaign) modules from the Lock ‘n Load Tactical system. Coincidently, each of these games takes full advantage of the larger playing space by increasing the size of the hexes, so that everything has room to breathe and it is relatively easy to manage the movement of stacks over the maps. The Lock ‘n Load modules are in fact single full mappers, but they have an X-Map version, which are double the size - yum! As for my figure games on hex terrain, being able to extend the table from 4’ wide to 6’ wide on occasion, will also open up new opportunities for the odd gaming fest. When you have been strapped for space, this feels most generous and can allow that sort of situation in which you can be winning on the right flank and facing disaster on the left, or have multiple victory locations and conditions. If you have always had this sort of space, you may well not fully empathise as to why it is an exciting prospect. Both my Tigers at Minsk WWII tactical hex based rules and ACW Two Flags - One Nation rules have been designed to play on a grid as small as just 8 hexes wide, but with movement restricted so that units on one flank will not unrealistically have an immediate influence on the other flank, but those game spaces have never really been big enough to also allow flanks to hang in the air, something you don’t have to have, if necessity is your bed-fellow, but is a real bonus if you can do it. The ‘Project Page’ on the Commanders website that I started in an effort to impose a discipline on my painting and modelling output, gave a month by month running commentary of how various projects progressed, though after six months I killed it off, as by nature I am not very good at working to an imposed timetable and sometimes it is worth remembering that above all else, this is meant to be a hobby! (plus, nearer to the truth, there had been a real lack of painting over consecutive months made the page somewhat thin and a tad embarrassing). Finishing off the ACW rules into a workable set and getting the Hastings game up and running have been the two intended figure projects for 2017 and have been spoken about before on this blog (see labels in the right margin). As the year ends, I feel that though the ACW rules work, they need another round of maturing and the 1066 project ....... well, to be frank, it just needs to happen! Another ambition for the year ending, which I have not previously mentioned has been to work on a general reorganisation of emphasis that I generally give my hobby time. For more years than I care to remember, I have been an avid boardgamer, collecting many and varied titles, but in recent years, I have defaulted to playing shorter, smaller and less involved games and this has brought a certain blandness to my boardgaming, that of itself has dampened interest with a result that my spending and gaming in relation to boardgames had significantly dropped until the past quarter. I think it is true with any rule set, that one needs to play a game a few times to get the best from the rules and understand the nuances of the system. Repeatedly jumping on the next new thing and ‘having a look’ is just not satisfying, but a trap that is easy to fall into with the prolific output of game companies. Better to buy less and get closer and better with game engines you play regularly. In wargames, I like the military history and dimension of the situation (I do not like resource management games), so like to see a game through to the end, giving the winning side a proper opportunity to explore the fuller triumph, regardless of the other side having reached a difficult position. Having a separate gaming space will probably help with seeing games played through to conclusion and also having repeated plays and although this extra space is somewhat temporary, it is a new opportunity to me, so can only do good. Not only has my board game buying drastically reduced in recent years, but on the book front, quality reading time had fallen away to virtually nothing. If I am looking for blame, then perhaps more recently the house renovation is an easy target and almost certainly, it has been too easy to flop down in front of the computer screen and spend too many hours browsing instead of doing something ‘real’. I suspect I am in good company with others! But doing some quick maths on the back of a beer mat, if I was to drop 30 minutes worth of the internet monster each day, that would liberate over 180 hours of potential productive hobby time each year, which when set in the context that this equals four and a half weeks of what we typically describe as the ‘working week’ of 40 hours, becomes a sobering thought if you have an army just sitting there waiting to be painted and really, I should be able to get a pair of small armies knocked out each year in the 10mm / 12mm scale, if I re-directed some proper time to it and stopped making excuses. So, as part of hobby re-organisation plans, I am aiming to having a more focused collection of boardgames that either use series rules or are the sort that have easy enough systems that I can return to frequently with ease to get a game, due to being very familiar with the rules. I will aim to have a midweek evening game that can be set-up, played and taken down in under 3 hours. I used to do this all the time many years ago and there were small kids running around then and a million other things to do, so I am not sure why modern life seems to offer fewer gaming moments and I am inclined to think this is more of a mindset thing rather than anything that is particularly imposed on me (computer screens certainly get too much time) - so to knuckle down and make the time and make an effort to do real stuff, will be the 2018 motto. Importantly, I will make sure that the shorter games at the dining table are interspersed with some quality bigger stuff on the pasting tables. The thought of having the year interspersed with some ‘wargame days’ or weekends sounds quite appealing. I have already decided that the Lock ‘n Load Dark July 43 module (tactical battles around Prokhorovka) will get an early outing to start the ball rolling and hopefully make an interesting AAR for the blog, as will their Bastogne Outpost module, which has a series of six linked scenarios. I am conscious that SS iconography and things such as the formation counters being represented on black backgrounds causes controversy on forum boards. The front of the Dark July 43 module is in keeping with the cover artwork throughout the series and it is a historical module. There are six scenarios in the module and one of them uses the full map for fighting around Oktiabrski State Farm and Hill 252.2, this gives us wheat fields, a farm complex, a rail track and small hill for some meaty armoured formations to fight over, but it is the size of the map that gives a chance to see these vehicles shooting over distances, so that the ‘to hit’ gun tables take on a greater significance than are present on smaller map scenarios and this should build up game tension as well as highlighting the various attributes of different vehicles. Having decided how my boardgaming will look and what it will deliver and having spent the last couple of months buying into those games that I need, I want my figure gaming to be versatile and fun and based around home grown rules. The flexibility of figures will hopefully allow me to cover a myriad of small engagement situations with a common ruleset. To this end, I will strengthen my figure hex gaming with some new and dare I say ‘prettier’ terrain features and expand my collections of 10mm and 12mm armies, with perhaps some early attention to 1944 west front to do the next module for my Tigers at Minsk rules (this is for you Steve). Perhaps I can imaginatively call the module ‘Tigers at Normandy’! For reading, I will aim to always have ‘a book on the go’. I now have a fireside seat, where I can sit with coffee and book and just have some quality reading time, so I want to ensure that happens at least a couple of evenings a week (ours is a household where thankfully the TV is not constantly on, so between selected programmes, I will do some reading instead of defaulting to ‘flop down internet time’ and just hope I don’t do the ‘nodding off’ thing, where the book falls to the floor!). To this end, I have started with Harold, The King Who Fell At Hastings by Peter Rex, published by Amberley, to re-familiarise myself with the full 1066 story. I feel like I want to race forward to the ‘Hastings bit’, but in truth, I am enjoying a return to looking at the background story of the social, dynastic and militaristic aspects of the period and hopefully some of this will feed in to improve my 1066 project. Rather like reading, I have decided that my biggest blockage to figure painting is not having something actually on the go. If there are figures on sticks, I will paint most days, but as soon as a batch is done, I know I can slide into several weeks of not doing anything. For me, the secret is always to ensure that there are a batch of figures already primed and ready to go, so as not to hit that natural pause in the painting habit. My discovery this year of Hammerite - special metals primer, which is particularly effective for the slippery qualities of lead, hopefully means I will no longer get those shiny bits of metal glistening through on the high spots of models. Being brown, it also goes someway to making horses a bit easier to paint, With a lot of Norman heavy cavalry to do next year, this is going to help. The downside is that I now have no excuse in starting to prep the side metal gate to the house that is starting to show signs of weathering. A purchase of some coloured Vallejo primers, lured by the prospect of a faster paint job, has not convinced me that this is the way to go as I do like black (not blue, grey or red!) as a shading base for where the paint doesn’t hit. One thing for sure, with the equivalent of 1000 figures to paint for the Hastings project, is that I need to get a better grip with speed painting and better embrace the principle of painting the unit and not the individual figure. The results can easily cheat the human eye, especially the older eye, but it does not escape the cruelty of digital photography, which tends to give over sharp images and allow ultra close inspection, followed by inevitable criticism - even if only one's own! Again a black base coat or heavy black wash at the start of the painting process will probably become my greatest friend. 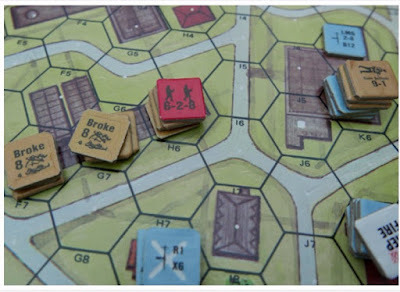 Tactical boardgaming (ever since my initial exposure to the joys of Basic Squad Leader) has always been my first love. I am a butterfly and jump from system to system, able to play them all, but perhaps being the master of none. This year I have decided to concentrate on just two commercial systems, so I have bought into GMT’s Panzer / MBT series and Lock ‘n Load’s new editions of Lock ‘n Load Tactical. These are an ideal format to get that midweek game in, especially when the rules become so well known that they are second nature, plus the play area needed can be relatively small. A couple of weeks ago, I did a post on the SOLO module for Lock ‘n Load (link in the Resource Section) and it produced something of a revelation, not necessarily of the system itself, but I learned something about my own style of solitaire play .... it turns out that my own company had not been as superb as I had thought! Well what it showed really was that during my many years (decades) of playing both sides as equals, I was in fact, by default, using exactly the same player style for each side. This should be obvious, but I never thought about it. The fall out of this being that I would always use a smaller range of options by not thinking outside of the box of my own play limitations. In essence I would predict how the turn would play out and then run the attacks and movements etc to match that sort of pre-determined plan and this would directly feed into a player style that was simply going through the motions of rattling off dice and getting through the turn without making a deeper connection with pieces and their situations. It’s not that this doesn’t work, its just that it is not as rich as it could be and it was only using the Solo module that made all of this so obviously apparent. It is at least something to think about and of course is good reason why face-to-face gaming is so enjoyable. While solitaire can be both do-able and enjoyable, it is not necessarily always enriching, though can be improved by a system doing something that reduces player control, such as random activation. I now do most of my small boardgaming (1 mapper or less) on a large pinboard with plexi on top, so that a game can be just lifted off the dining table and put somewhere else, allowing me to get through it over several short sessions or at least not having to pack away because the evening meal needs the table space. The same sized pinboard can also take an 8 x 6 hex grid, using the Kallistra 4” tile and it was for this size of space that the Tigers at Minsk rules were initially developed. On the Napoleonic front, I have set the Eagles of France Boardgame series from Hexasim as my series of choice. To date there are three modules. Waterloo, Austerlitz and the only just released Ligny (still in the post), with Quatre Bras (one of my favourite battles) promised to follow. These have some small scenario options and then the bigger scenarios can go onto my temporary table for some meatier play. They seem to sit between low and intermediate levels of complexity and hopefully reach a sweet spot for enrichment of my gaming in terms of access and practical application. I also hope that in 2018 I will return to my Eagles at Quatre Bras hex rules and move them on from their current Beta status, but really I want painted armies up and running to immerse myself in that particular project, though I am contemplating creating wooden block armies and over time just replacing each block with a proper figure base as they get painted. This does at least allow the prospect of significant playtesting and getting things right along the way, simply because of the huge amount of work that is needed to bring rules to a unified working model. As already said, for the past few years, my overall buying of boardgames has significantly reduced to just collecting products from a few favoured firms. To to gear myself up to moving the collection for my re-organised way of playing, I have recently picked up Red Typhoon and Arracourt from Revolution Games, the Panzer / MBT series from GMT, the new editions of Lock ‘n Load Tactical from Lock ‘n Load and selected titles (Saratoga, Brandywine, Guilford and Germantown) from Battles of the American Revolution series from GMT and the Eagles of France Napoleonic series from Hexasim. As a one off purchase, and an unusual area of interest for me, I picked up GMT’s Talon, a tactical space combat game, that has relatively simple rules and a rather wonderful mounted hexed black hexed game board. It has been described as a playable Star Fleet Battles type product - I hope so. All of these should see some exposure on the blog in 2018. Going back to my main figure projects for 2017, I have been enjoying putting together my ACW hex rules (Two Flags - One Nation) and the scenarios that have fallen out of that. I love tinkering around with game mechanics and think there are a few good ideas in those rules (but then I would, wouldn’t I :-) ), but I am also aware that there is a certain awkwardness to the rules and would like to think a bit more about stream-lining without losing the elements that are felt essential. It was particularly pleasing to see that a fellow blogger (Jonathan Freitag) had put a lot of effort into designing a scenario that used the rules and producing a couple of nice AAR’s on his Fox’s Gap scenario, which I have also played and enjoyed. This sharing and supporting aspect of the blogosphere makes involvement so worthwhile. There is a link in the resource section below to Jonathan’s opening article on Fox’s Gap. A desire to get my beta Eagles at Quatre Bras (napoleonic hex based rules) and Two Flags - One Nation rules to merge into a general Horse and Musket set, has proven somewhat illusive and I am not sure whether to service three different rule sets (to include AWI), or whether to go for amalgamation and just try to streamline them and try and reduce some of the awkwardness of the various sub-systems, that give (a somewhat false it must be said) impression of complexity. One of the obvious issues is that the Napoleonic set is at the brigade level, while the ACW set is at the regimental level, as both designs began life independently of the other. As for the Hastings 1066 project, it is still in hand and has started moving forward again, though it will some months before a game can be played. A few years ago, I was fortunate enough to have a Hastings boardgame design put into print, so the basic mechanics and game engine already exist for a conversion to hex terrain, though the limitations of my table space means that the battlefield and forces have to be compressed by 66% and the morale levels adjusted accordingly. It is also an opportunity to tweak a few things, but overall I am happy with the way things are progressing, at least in my mind and this may be another opportunity to deploy some wooden block units to the table, while I wait for the forces to be painted up. There was a real sticking point with how to base these forces and at the start of the project, which resulted in rebasing to take things into a slightly different direction. I have moved from 2 x 40mm double ranked heavy infantry bases per unit to a single 80mm base per unit and increased heavy infantry to triple ranking while maintaining double ranking for medium infantry. The heavy cavalry remain single ranked, but put on deeper bases so that they could fixed in a looser form to give a sense of movement. They don't look good perched on hills, so that part of the base hangs in mid-air, but being able to identify unit types at a glance and moving fewer bases around, which over the course of a game becomes a significant in terms of unit management, means the big bases get the thumbs up. The napoleonic project has perhaps seen my greatest frustration. I was supposed to have two 10mm armies painted up two years ago, using them to develop my beta version of my hex rules, but have messed around with 10mm, 15mm and 28mm, getting nowhere fast. I suppose in my small space, I want a couple of brigades per side, perhaps a division, with enough space for different towns, villages and hamlets to be represented and so the smaller scale is more in keeping with those goals. With my figure projects now concentrating around the 10mm / 12mm scales, going to a single sized terrain becomes the fall-out benefit and the off-loading of 15mm / 20mm / 28mm terrain collections can be measured by volume in terms cartons and plastic crates and that translates into serious relief on storage pressure and also generates funds for some significant boardgame purchases. Those sales amongst other things also allowed for a supporting membership of the BoardGameGeek forum, which I use daily and to support my Commanders website hosting fees. There is an obvious cross-over between my boardgaming and figure gaming because of the use of hexes. I know not everyone gets along with them, but I have found that after years of use, visually they somewhat disappear, but subconsciously they are there, helping with my function of play. In fact recently I had the hex tiles out just because the battlefield I wanted was a bit complicated and I wanted to use the modular modelling advantage of the hex to get the right elevations on the table. I was playing an ‘open’ game, but I struggled mentally to not having units sitting exactly within individual hexes - it seems for me, if the hex is present, my eye can ignore it, but the brain can’t. So I suppose it is just one of those things that either suits or doesn’t suit. Interestingly, I find squares more ‘obvious’ than hexes, so perhaps it is just a case of what you are used to. I am noting that quite a lot of blogs in 2017 have been demonstrating Commands and Colors (boardgame) using figures and hex terrain and the new ‘To the Strongest’ rules by Simon Miller, that uses squares, is gaining a lot of interest from people who would never have contemplated using grids. Add to this mix the new Rommel rules from Sam Mustaffa, that also use squares and there seems to be a new appreciation of the grid for figure gamers and perhaps the cross-over between grid and figures is becoming a bit more mainstream, especially as some firms are offering game mats with the grids already drawn out. One of the interesting thing about the Simon Miller games is that most commentators are setting up gridded tables, but taking pains to ensure the grid is as subtle as possible, so there is an embracing of grids for their functionality, but not for their aesthetics it would seem. 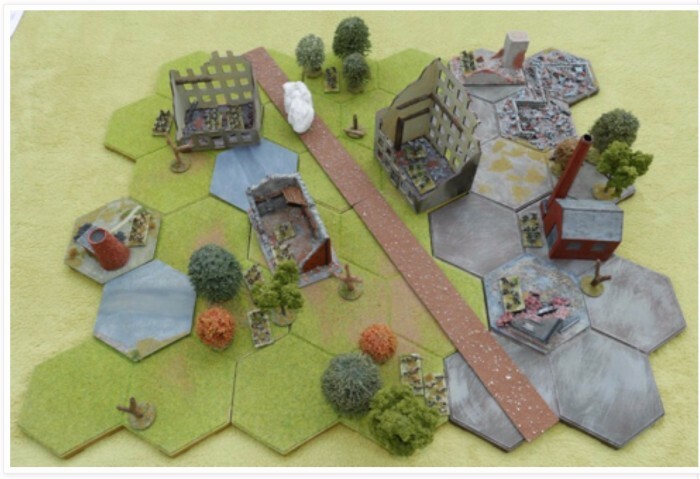 Below is a hexed terrain layout that I did for 10mm Gettysburg and in my own opinion the aesthetics are fine. Over the past year I set about trying to improve my hex terrain. This has made quite good progress, with some nice resin pieces added and an increased capability to add incidental terrain and textures to the table, just to dress it up a bit more. I have obtained the large Kallistra 2 hex wide river and a nice double span bridge to match and slope pieces have been bought in enough quantity to allow some larger contouring of the battlefield. This of course was primarily done to get a long Senlac Ridge onto the table for the Hastings games. All my waterways have been repainted with vallejo 71.111 USAF Light Blue (a slightly muted blue) and given a dirty wash, to bring some unity to them and dampen down their reflective state. So overall, for 2018, things are being put into place to increase painting, reading, focussed collecting and actual quality gaming for the next 12 months. So if 2017 can be viewed as a year of sitting on my hands and some procrastination and misdirection, I see 2018 as being an opportunity to creating some better quality hobby time. Only time will tell. Blog sphere wise, the number of well serviced blogs seem to continue to grow and there is a lot of thoughtful, graciously produced and shared content about, the sort of thing that gives a good read with a coffee, and it may just be me, but I am sensing a bit more engagement with a readership who do the courtesy of commenting on blogs rather than simply consuming and moving on. Though I still think it needs to improve. My most recent article was a review on the Lock ‘n Load Solo system. I played the game a dozen times before writing about it and then did an in depth article of over 5000 words. Today I note it has had almost 1400 viewings, but just 10 comments have been made by others (not including my responses). I say this not to moan, but just to evidence the points that there is still being a problem with the writer / readership balance in terms of interest and appreciation of free but decent content. Our blogosphere is something to cherish. By the time I have gone through the various blogs each evening, it must surely be the equivalent of a wargame magazine coming out every day (£4.50 if a price were to be put on it) - though with the content entirely tailored to my interests, amazing really. Anyway, I am grateful for those who do give freely of their time to blog, a lot of my enthusiasm and motivation comes from the blogs of others, especially the pro-active painters, who constantly remind me that I need and should do more. I quite enjoy blogging and also running the Commanders website, for which I have just payed up my subs for another year, so it is advert free. I am pleased overall with the articles that have made it to the blog this year and the way that the Commanders website has been reorganised (links in the resource section at the foot of this post) to give something a bit different than the blog. Each continues to evolve with a little tighter focus, while complementing the other. The nature of both places are still embedded in the ethos of supporting the smaller type of game and considers gamers with limited gaming and storage space, even though my own potential gaming space has recently slightly grown. In the main, kitchen table style gaming is a common denominator to much of my output. Last year, I listed my top 5 visited posts and the top 5 countries that viewed my content. The problem with that is the skewing of results. By listing the posts, they all get visited again and of itself that tends to distort future figures. As for viewing countries, the ‘bot’ thing, which I assume is actually practised by several nations, not just the ones that seem to attract blame, distorts things, so those stats are probably useless and really, who cares! In any case, my blog shows the top six viewed posts in the current week and this typically has the two most recent posts and then really the rest are quite random as the blog now has a significant data base of articles for visitors to dip into, though it is the case the some old favourites seem to keep coming into the top six and the ‘Comparing Lower Complexity Tactical Systems’ post has seldom been out of the top grouping in 3 years, quite incredible, though a ton of work did go into that particular post (there is a link in the Resource Section below) and again, some observational evidence, it’s 12000 visits and worth are not reflected in the number of unique comments (13). A guiding principle to my blogging is acknowledging that this audience is worldwide and as individuals we all inhabit a different place in terms of playing space, budget, available time to play, disability and a host of other reasons that makes gaming accessible to varying degrees to gamers. I am also conscious that much of my blogging references new materials and the balance of doing that and not flaunting consumerism is a tough balancing act. Anyway I hope this blog in general terms reflects a respectful tone. I always wonder whether I will run out of things to say on this blog, but looking towards 2018, there are a number of things that will make good topics. The 1066 project will hit a point in which a game can be produced and rules and design decisions will be discussed, the Tigers at Minsk rules will have (hopefully) a West Front ‘44 module, napoleonic armies should be started and hopefully the Two Flags - One Nation rules will mature into something that I am more happy to think about as being ‘done’. I have a crop of boardgames that to date have not been covered by the blog, so they should surface over the course of the year, with most falling into the ‘single session, kitchen table gaming’ category, but with a couple of those ‘game fest’ type games also in the mix. I would like to get 'Cobra' (S&T magazine) to the blog, the game that actually started my boardgame passion at the back end of 1977. Something I really want to do is to produce a couple of boardgame designs that could be called something like ‘3 page Bulge’, with a map, counter sheet and just a couple of pages of rules being available for download, perhaps such a thing might make a good Christmas Day post next year (I remember thinking this last year, so don’t hold your breath!). And then there are always those things that cannot be known in advance, but which crop up out of the blue as suddenly capturing interest. So already 2018 is likely to be productive, perhaps more so than 2017, now that the house renovations are pretty much sorted. I hope so. Some interesting moments in the year. To an entire generation, there remains something magical about the first scenario in the 1977 edition of Squad Leader ... The Guards Counterattack. This got onto the table again this year for a blast of nostalgia. Below is a shot of the first game, which was as tense as ever and as you can see (red unit) produced a berserk unit - a trademark of SL. After this game, I went to the copiers with the mapboard and had it blown up to double size for a face-to-face game with Mike. Altogether, a system that keeps on giving. Perhaps doing my own conversion to the Lock 'n Load format would be interesting for another face-to-face game. This year I returned to GMT's Panzer series, having sold it previously as part of my 'jumping around systems' tendency. At 100 metres to the hex, it rewards the player with scenarios that use common tank engagement distances (700 - 1500 metres) and with the room to create flanking possibilities. It brings a different gaming experience than the crop of 50 metrtes per hex designs and of course this has a level of detail that is unique to the system. This is the cover box to the first expansion, with T-34's replacing the big cats (panther tanks) on the flame orange background that comes with the base edition, which of itself was meant to capture the spirit of the Panzerblitz artwork of 40 years ago. Fox’s Gap is an interesting ACW scenario that has roughly a brigade per side and the advantage that they include all arms, so there is a ton of nuanced gaming to come out of the situation. Jonathan Freitag kindly put the scenario together with a view to delving into my Two Flags - One Nation hex based rules and he ran a couple of excellent AAR's. His blog link is given below in the resource section. 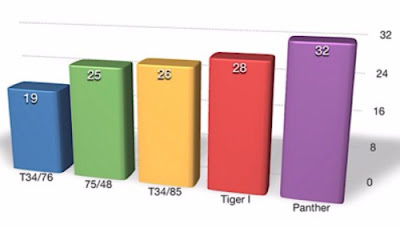 As I cycle through various tactical games, I take an interest in how T-34's (the 76 and 85mm models) stack up against the Tiger I and also how designers differentiate between the Panther and the Tiger I tanks. Over time a number of these comparison posts have been posted at this blog. This is the graphic from the Panzer series showing gun values. The various posts try to evaluate whether the characteristics of each vehicle are reflected in the game both in terms of gun / armour comparison and actual tactics. This year I started a series of posts that had scenarios played out on a 6 x 6 grid or an non-gridded equivalent . Useful for the space strapped gamer, but also a reminder to all, how much good gaming can be had out of a small space. We could increase this battlefield by two more hexes to the width (8 x 6) and it would just fit onto a large pinboard using 4" hexes. Finally, my soapbox rant .... A readership makes the work that goes into blogging quite rewarding. To those who value blogs, but just browse and move on, I would encourage you to stop every now and then and just interact with the author. An author does not want a full time job responding to a million comments, but a needed balance between being taken for granted and doing work that is valued by the community should be obvious, it makes the sharing aspect of the blogosphere a richer place for everyone. For those that already do this and / or follow, thank you on behalf of all people producing free material. For those still in a reading mood and ready for a coffee top-up, I have included a number of links in the resource section below that will guide you to some more selected content. Also, check out the lists of blogs that I follow, in the right hand margin of this post, there is just so much gaming goodness there. Best Wishes and good gaming to all for 2018 and a special thank you to all those that follow this blog or comment, your support is much appreciated and lays at the root of this post. Thanks Steve, I nearly didn't post it as I thought it may have been a bit self-indulgent, but after a couple of reads. I decided that there would be certain aspects that readers would identify with - perhaps even a lot! Thanks for yearly support and your own out-put. Cheers Norm. I am sitting at my computer early on Christmas morning (too early in my opinion ... but not our cat's!) reading your blog, and many of the things you mention or write in some detail about resonates with my own thinking. It sounds to me as if you are doing something that I keep saying that I will do - and have not yet done - which is to try to focus your time and attention on a few projects that you can complete within a reasonable time-frame. Your mention of your back problem struck a chord with me as I now find that bending over can be extremely painful, and has meant that I can no longer take part in lawn games using 54mm figures, and have had to resign myself to being an unofficial photographer and recorder of such battle. It has also meant that I have concentrated some of my efforts of developing gridded wargames that will fit on a small tabletop. As to attending wargames shows ... well I am finding them either too crowded or too far away to enjoy making the effort to go to all but a few. SALUTE was better this year, but the flooring is still very tiring to walk on or stand on, and having to stand on the DLR to get there and back makes the journey difficult and often painful. Reading your blog entry has made me realise that I need to sit down and give some serious thought to what I am going to do during 2018. One thing that is certain; I have at least one - and possibly two or three - books to write, and this will require me to do less blogging and possibly less wargaming. I also need to finish my Napoleonic project, which made quite a bit of progress before coming to a grinding halt about halfway through the year. So it looks as if I'll be doing less blogging and more of other things for the foreseeable future. Have a great Christmas and a Happy New Year ...and thanks for making me think about what I am going to do in 2018. Thanks Bob, it's a funny one really, you may feel that your own wargaming is being squeezed a bit, but your own 2017 was rich and productive with two books out that plenty of blogs are showing have had the effect of making others game more and get more out of their gaming. All the best for the New Year. Norm, your "2017 Reflections and 2018 Foresight" post was well worth the wait as you suggested in your earlier, teaser, post. You lay out many interesting thoughts, insights, challenges, directions, and epiphanies in your hobby recap and look-ahead; most of which I find myself nodding in agreement. Responding to each topic and idea you put forth would likely result in a response half as large as the original. As Steve J. notes above, my responses would be hard-pressed to stand up to your eloquence. I appreciate your mention of my work on providing a scenario for your "TF-ON" ACW rules. Having discovered "TF-ON" in 2017 and after many playings of your scenarios, I found the motivation to try my hand at developing a scenario. For both gaming in a small place and solo play, "TF-ON" revealed itself as enjoyable and challenging. Each game always provided a compelling narrative that fit into a believable, historical context. You hit a sweet spot on the gaming spectrum with this one. One day, I will give your similar WWII rules a work out on the gaming table. For 2018, one or two more scenarios are planned from me. That inspiration you fostered should be an indication of the solidness of your design. I find each of you blog posts intelligent, thought-provoking, and well-crafted. My hope is that 2018 sees no reduction in your blogging activity since each new post is much anticipated. Merry Christmas, Norm, and a Happy 2018! Thanks Jonathan, your support around the blogosphere is always so generous. I hope that both my blog and the Commanders site continue to give interest throughout 2018 and staying on top of TF-ON is a priority. Best Wishes for the New Year. You will not regret switching to a special metals primer. I switched in 2008. Also you might like to know that the B&Q own label version is available in white, is cheaper and can be easily coloured with acrylic paint. Thanks, I can't believe that such a suitable household product has been under my nose all these years. I only have a small tin, but it looks like it will be servicing quite a few armies. I was surprised at there being a white version, probably the better bet for anyone wishing to basecoat for bright colours. Best Wishes for the New Year. An excellent post Norm, thanks very much for taking the time to write it - and for the time you spend on your site over the course of the year. In some ways your post covers so much ground that I hardly know where to begin to respond, and it will take me a day or two at least to fully consider anything. I think I will just mention one thing: although I am not an old school gamer, Young & Lawton were really onto something when they advised the miniature gamer to stick to one period and one scale, because that way everything in one's collection works together, one can get a really first-rate set-up on a relatively limited expenditure of money and time. Obviously I haven't followed this myself (as if!) but I have tried to retain as much of that wisdom as I can. I'll write about this more in my own end of year blogpost, but this year has shown me something about what the best gaming year could look like - and it is pretty scary, because it shows that the hard limits on gaming are a lot harder than I thought they were. As gamers, we can afford to have collections that if not smaller, are narrower and we couldn't possibly notice the difference, because we wouldn't get around to the wider bits anyway. But more of this anon. Thanks again for another great year of posts. I'm still thinking deeply about your insights about solitaire play styles and working out how I can incorporate that into my gaming. Thanks, I like the Young & Lawton advice, and for those lucky gamers who really can concentrate on one period and scale (they must wonder what all the fuss is about), a single minded purpose must be a wonderful thing. I'm guessing most of us sit at various points outside than Panacea, with butterfly being the most apt description. I look forward to your end of year post and have enjoyed your own blog output over the year. Best Wishes for the New Year. A wonderful set of reflections on 2017 and most enjoyable to read. I will be re-reading as there was so much content. All the best for 2018. Thanks Peter, I look forward to all your new posts as they invariably include a few new ideas and everything is centred around playability. I hope you continue to entertain with your campaigns. Best Wishes for the New Year. A great read as always! You some things up so well. I have had to drastically downsize after moving continents back to the UK. But still manage to have a 4x4 table set up to play on. 6mm moderns and a variety of boardgames. I too have invested in Panzer and MBT. Really enjoy MBT as it lets me play tactical games in my favourite period without the terrain demands. Thanks again being really interesting to read. Thanks Dave, when I first started the blog that reflected by own gaming situation, I was amazed how many people regularly games within limited spaces. Neither the magazines or shows do much to recognise or support this aspect of our hobby. You will of course know that two MBT expansions will be launched at the same time, probably in the first quarter .... we need another Christmas, soon! Best wishes to you and yours for the coming year. Norm. Thank you, your articles and blog are most appreciated for a good read, over tea/coffee normally, not just today. This being a nice post to land on between the rush of the rest of the day. Looking forward to the new year and new articles, and whatever you do get to doing. Now I need to look at those metal primers.. The links for further reading I will save for the afternoon recovery from lunch! Thank you. I did a test with some Peter Pig15's, undercoating in my Vallejo poly primer and under coating in the special metal primer. The Polyurethene primer rubbed of so easily, even with normal handling during paint, the special primer had to be worked at to get it off the metal. Thanks for supporting the blog, Bet Wishes for the New Year. Most kind to post the summary. Thank you, I am glad you enjoyed the ramble! it was indeed a Hexmas as I was given a set of the X-Maps by Lock 'n Load, which are enlarged and have big hexes to match. Best Wishes for the New Year. What a great post, Norm, and I am very much looking forward to Tigers at Normandy!! From your blog, it looks to be an amazing 2018, and I am looking forward to following it, coffee in hand. Thanks Steve, I was really pleased that you had a go at two sets of my rules, especially as I think there is a learning curve to them, but you stayed with it. I can only say that I am sorry to have come so late to the party (your blog), but have been enjoying diving in to back article and in the last quarter your out-put has been significant. Good AAR's are hard work and consume a lot of time - thank you. Best Wishes for the New Year. Thank you sir - I love to share my gaming experiences, and also to go back and read through to see how my thoughts and activities have evolved over the years. I always love reading what other get up to in their gaming life so I did enjoy your 2017 overview. Very interesting and some great insights. 2017 showed to me more than any other year that I am a wargaming butterfly and so will make no plans, keep getting more stuff and even at my age still think I will find time to play stuff. I do enjoy your tactical WW2 boardgaming posts but 2017 was also the year I finally figured out I prefer getting out the minis to play, rather than the tactical hex-based boardgames (operational and strategic are still boardgames rather than minis). I think it is the tactile and visual aspect of the minis that I just have not got enough of yet, rather than the decision-making -the latter I think you get more of in the tactical boardgames. Shaun, I still hold your games on a 2 x 2, in a drawer, posts as being inspirational and judging by your hit counter, so do many others. Both sides of the hobby (boardgames and figures) have some really great products out and its good that the variety is there that we can pick and choose. Best Wishes for the New Year. As one of your followers that does'nt usually remembers to stop to interact, let me just voice my appreciation for your efforts. I always enjoy your posts, and the Commander website as well. Please continue doing what you do so well, my hobby life is much the richer for it. Thanks! All the best to you, Norm! Thanks Aaron, I have as ever, enjoyed your blog this year, with reinforcements arriving to your painting table and some reflective posts adding to fun. Looking forward to more. Best Wishes for the New Year. Hello Norm - Just finished reading through the above with a couple of cups of coffee and I must say I found it really thought provoking. The contrast with my own current hobby situation is pretty stark and it made me realise just how far my enthusiasm for the actual Wargame element has fallen over the years because I used to be very much like yourself, every spare moment was spent thinking and planning, writing rules, designing scenarios etc. I even used to take figures to work with me so that I could spend my lunch hours basing! Somewhere along the line, something has gone wrong and I would dearly love to get back some of that old enthusiasm. As much as I have tried to break away from hex based games I have no doubt in my mind that they work so well and both your ACW and Tigers at Minsk rules keep on calling me back for more reading. I could go on and on here Norm, as 2017 draws to a close I seriously need to re evaluate my approach to my hobby for the coming Year, and the idea of small space games that can be played in comfort on well designed hex terrain is very much on my mind. So thank you for taking the time to write this post, your boundless enthusiasm is most inspiring. Thanks Lee, it seems a strange term to use for a hobby, but I am sure there exists a level of hobby anxiety or doubt that we all endure to one degree or another and I sometimes wonder whether we have made this wargaming thing more complicated (or perhaps sophisticated) than it needs to be. Although what we have today is superb compared to 1975, I can't help feeling that that we may have lost something along the way, perhaps a even certain simple naivety. I am going to try to have a new resolve of 'just do it' and so hopefully in 2018, some of the early posts will reflect some of that ethos. Best Wishes for the New Year. "I am going to try to have a new resolve of 'just do it' "
That's what I'm trying to do on the painting front at present Norm. I think I get caught up in trying to paint my minis to a wargames magazine standard, rather than to a nice table top standard. Of late I've been doing some simple paint jobs, with a wash followed by a few highlights. Nothing fancy but effective and looks ok on the gaming table. If I can keep this up my painting output should increase dramatically. This will naturally lead to more games of a different nature as I will have painted units to play with! Despite the great good fortune of being able to sit down and talk about all these things on a regular ftf basis, I still look forward just as much to sitting down and reading your yearly Christmas post. I particularly look forward to ypur opportunity to leave larger games up for longer periods. High on my list of hoped for encounters is Rising Eagles and the chance to try out the system with the whole Austerlitz campaign. Hi Mike, Austerlitz (Rising Eagles) seems to be ready made for the sort of level I am thinking of. Thanks for a year of good gaming and until we raise batons again in the New Year, best wishes to you and family. Very nice post and I appreciate the effort to write such a lengthy one. Too much stuff covered to leave a response to each point but I agree that it’s too easy to get distracted by multiple genres and scales which diffuses our already sparse hobby time. Well, I waited until Boxing Day to make time but it was a good post, worth the wait and the time. So many familiar issues and good ideas! 2018 certainly looks promising both for you and for us who are looking over your shoulder and listening in. Thanks! and here's to The Year Ahead! Thanks Ross and thanks for a year of your own gentle posts that together with the marvellous table scenes, are just a pleasure to read. Best wishes for the New Year. Happy Christmas. Thanks for your annual Xmas blog post which I enjoyed enormously. Thanks also for your continuing blogging, glad you didn't give that up for long! I'm also very glad to hear that Tigers at Normandy might be on the cards for next year, I'll forward to that. Have a great 2018. Hi Jay, thanks for kind words, I keep half expecting to hear that you have done a deal with a company because your projects are so tightly written. Hope you are getting a decent break from work over the hols. Best Wishes for the New Year. Norm. Just joined your band of followers. Thanks for your excellent Xmas blog post. Looking forward to following you in the new year. Paul, thanks so much for showing you support by following. I hope you enjoy the content for 2018. Best Wishes for the New Year. I guess many miniature wargamers fall into the same traps: hoarding and planning, which means the time left for actual wargaming is significantly reduced. Hi Phil, I have noticed an increase over the past 2 years of posters that say they have either had a big clear-out or that they are not buying any more kit and most talk of their lead mountain as something that has left their control, perhaps the realities of storage space is what brings us up sharp. Having said that, this year I want to return to my first boardgame ever, something that I got rid of many clear-outs ago!so that has involved me sourcing an unpunched copy (from 1977), but that is a one-off, overall I think clearing out is good. Looking forward to more on Tiny Tin Men. All the best for the New Year. Hello, Norm, really appreciated your year end summary--and like others, can relate to many points therein! I will have to check out the Commander's website as well. "Anyway, I am grateful for those who do give freely of their time to blog, a lot of my enthusiasm and motivation comes from the blogs of others, "
Well said, and certainly true of your contributions. Thank you Ed, if we could get wider audience participation, outside the usual supportive faces, we would have taken a step forward. Thanks for kind comments, have signed up to your blog and will be interested if the Grid Page expands. Best wishes for the New Year. What a post, so many splendid games (and reflections) here...but I had to drink three coffees in all! Always a pleasure to come here Norm! Goodness that is some review. I'll have to come back to read it all, but your comments about storage and inertia sound all too familiar. I now have so much stuff that any time I want something specific I have to move it all around. It's like a Rubix Cube! As terrible as it sounds, even a trip to the local refuse centre to get rid of the things that won't easily sell, brings with it, a definitive decision and certain peace of mind. I enjoy your blog posts as you regularly cycle through the same kind of practical questions on scale and basing etc that pass through my mind.